If you have crooked teeth, Invisalign Express can be the solution to your problem. It is an innovative technology that straightens teeth at a low cost. Invisalign Express is a completely invisible dental appliance that corrects your teeth slowly without any pain. People choose Invisalign Express instead of traditional braces because the total treatment time is much faster. What are some details about the appliance? The appliance is made of a clear plastic material that slips into your teeth. Once applied, the aligner will move your teeth to a more aligned position. Within three to six months, your crowded teeth or spaced teeth will be corrected. The complexity of your dental problem will typically determine the cost of your treatment. The number of aligner trays that you will need and your dental insurance plan will also determine the cost. An estimate will be given when you visit the orthodontist. The orthodontist will also tell you if your insurance will cover some of the costs. Since Invisalign is considered an orthodontic treatment, nearly 25 percent of patients get an insurance compensation. Though, other things can increase the costs, such as the type of treatment that you need and the length of the treatment. Financing options are usually available at the orthodontist office. However, if the orthodontist doesn’t offer to finance, you can obtain services from a third-party company. Traditional braces and Invisalign braces are offered at somewhat similar prices. 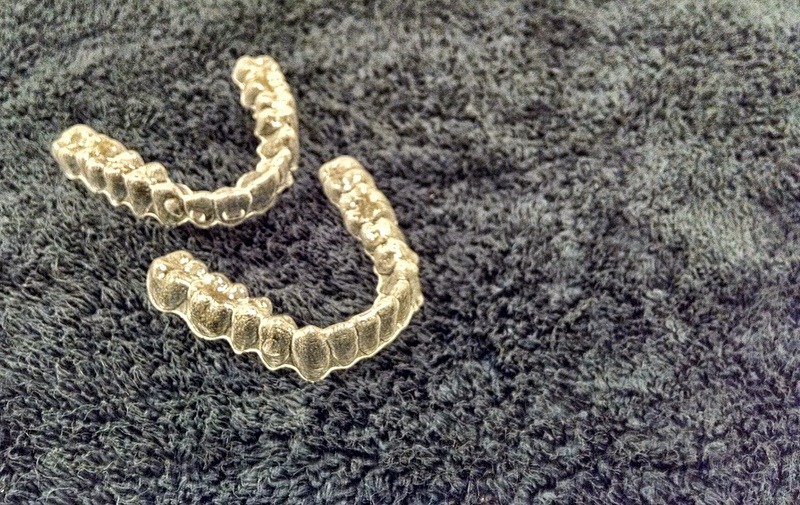 However, Invisalign braces are more practical because Invisalign users gain benefits in unique ways. Since Invisalign aligners are made from smooth, BPA-free plastic, the appliance will correct teeth gently and comfortably. Metal braces cause pain whenever the wire cuts and rubs into your mouth. This is why people who wear metal braces never play many contact sports. Invisalign aligners should be worn for 22 to 24 hours each day for about 18 months. Though, you will only have to visit your orthodontist every four to six weeks for appointments. If you wear metal braces, appointments will be required every four weeks. So, users who choose Invisalign braces spend far less time at an orthodontist’s clinic. Can Invisalign fix crooked teeth? There are a variety of reasons why teeth grow crooked. Some individuals have mouths that are too tiny for their teeth. In this situation, the teeth will crowd, which will make them shift. Crooked teeth repaired by a skilled orthodontist is essential because it affects your chewing and brushing; gingivitis, tooth decay, and cavities can occur from crooked lines. If you are an athlete, you will strain your muscles, jaws, and teeth. As a result, the pressure could break a tooth. To treat crooked teeth, the orthodontist must take X-rays to determine what kind of treatment is needed. By examining the X-rays, the orthodontist can gather information about the position of your roots and teeth. The X-rays will also display any of your teeth that are lodged through your gums. panoramic X-rays will be needed for advanced examinations. After the diagnosis is complete, the orthodontist will choose a suitable treatment for you. In some cases, a removable retainer may be the best treatment option. However, when teeth are severely crowded, one or more of them will need removing. Braces are recommended when the case is minor. Extreme cases will typically require some sort of surgery. What is the Invisalign certification process? Some orthodontists do not use Invisalign appliances because specialized training is required. Align Technologies is the organization that trains orthodontists so that they can use the aligners. Since April 2007, about 20,000 orthodontists in the U.S have completed the training course. Invisalign made a new appliance designed specifically for teens. It features similar technology as the original appliance, so teens will achieve the same results after the treatment is complete. Invisalign makes teen appliances so that teens can maintain their self-confidence and self-esteem at school and in other social environments. The appliances were developed by a leading orthodontist who understood the needs of teenagers. As a result, the new aligner features a Blue Dot Wear Indicator, which fades when the aligner wears out. This feature helps teens know when the aligner should be changed. The aligner also has Eruption Tabs that accommodate molar when they grow. Although Invisalign Teen repairs these problems, an orthodontist must determine if the aligners are the right treatment for you. If you qualify, the orthodontist will take impressions and pictures of your teeth with 3D technology. What are the advantages of Invisalign for teens? Teens appreciate that the clear aligner lets them attend social events confidently. When teens wear traditional metal braces, they feel self-conscious; this is why they hardly ever smile. Traditional braces are also tough to clean. Plaque and food often build up around metal braces since teens never brush and floss their teeth properly. With the aligners removed, better oral hygiene is apparent. Team Demas Orthodontics in Southington, CT.
Our orthodontic practices have the state-of-the-art diagnostic equipment. We assure a wonderful patient experience. Some of My Teeth Need to be Repaired, Must that Be Done before Orthodontics?